The clients were looking to expand their small farmhouse sitting on three quarters of an acre adjacent to the Mill River in a quiet neighborhood in Florence, MA. The 600 sf addition provided much needed space for socializing and entertaining in addition to improved storage and circulation. The addition of a front porch improved the exterior aesthetics and reflected the character of neighboring homes. A new mudroom was added to improve entry into the home. 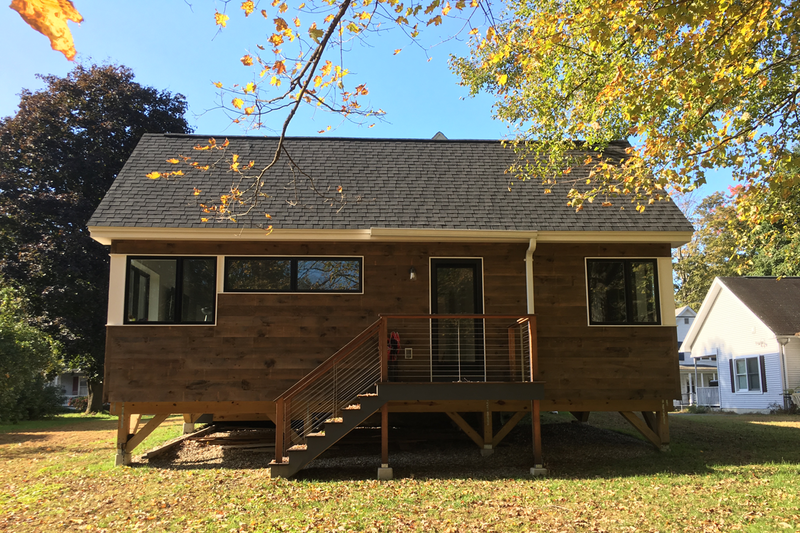 But the largest impact stemmed from the rear addition, a contemporary take on a traditional barn featuring locally sourced pine board siding, highly insulated exterior walls, an abundance of windows, and a pier support structure. The resulting space preserves views, improves energy efficiency, and brings additional light and living space.